Medical marijuana was approved by Massachusetts voters in 2012, and the law provides that individuals who qualify for the use of medical marijuana cannot be punished for using it. Barbuto suffers from Crohn’s disease and was using medical marijuana two to three times per week, although never during the work day, when she began working for Advantage Sales in 2014. After failing a mandatory drug test, Barbuto was terminated by Advantage Sales on the basis that Advantage follows federal law and not state law, and of course the use of marijuana is illegal under federal law. In upholding Barbuto’s right to bring a disability discrimination claim under State law, the Massachusetts’ high court stated that although an employee’s possession of medical marijuana may violate federal law, that fact does not make it a per se unreasonable accommodation. The court further stated that even if allowing the use of medical marijuana was unreasonable, Advantage should have still engaged in the interactive process with Barbuto to determine if there was another potential, reasonable accommodation, such as using another drug that did not violate the company’s drug policy. Advantage will have the opportunity to demonstrate the unreasonableness of medical marijuana as an accommodation on remand. While the court allowed Barbuto’s disability claim to stand, it did state that employers do not have to tolerate the use of medical marijuana during work time, nor allow medical marijuana for individuals in safety-sensitive jobs or those covered by the federal drug-free workplace laws. The court additionally stated that there is no implied statutory cause of action for individuals alleging a violation of the state’s medical marijuana law. As reported in prior postings, Ohio’s medical marijuana law is much more protective of employers than the law passed in Massachusetts, but it is of course difficult to prevent determined courts from finding ways around what would otherwise be clear provisions of the law. Has it really been more than a month since my last post? Holy cow, we’ve got a lot to cover. Here’s what you need to know about what’s been happening in Ohio’s medical marijuana industry. Level I applications will be due in mid-late June. The Department has scheduled two separate deadlines for applications because it does not know how many applications to expect, and does not want to be overwhelmed at the outset. We should have a much better idea of the hard deadlines once the applications themselves are released. Interestingly, following the release of the applications later this month, the Department will hold a webinar explaining the applications, followed by two 1-week periods in which the public can submit questions for clarification on the application. The webinar, as well as answers to any questions, will all be posted on the Medical Marijuana Control Program website. Section 1: Applicants will be identifiable and will address mandatory requirements (presumably the required liquidity, compliance with tax laws, background checks, etc.). This Section will be scored on a pass/fail basis. Also, the Department of Commerce has totally eliminated the designated territories referenced in the last post, so it will judge all of the cultivator applicants in each Level against one another statewide. This is a welcome change, in my opinion. You can view the latest medical marijuana cultivator rules by clicking here. The Department also has provided some information regarding updates to the rules for medical marijuana processors. To begin, the designated territories have been removed (as was the case for cultivators), although the total number of medical marijuana processors to be licensed in Ohio remains at 40. The escrow/surety bond requirements have been reduced from $500,000 to $250,000. Various other changes have been made to the processor rules, including changes to non-solvent extraction methods, the ability to acquire expired medical marijuana from dispensaries, and packaging/labeling requirements. This updated draft will now be submitted to the Common Sense Initiative and, accordingly, there will be further opportunity for public comment. The updated rules for processors have not yet been posted publicly, but when they are they can be viewed by clicking here. Note: for medical marijuana products the supply is limited based THC content, not the overall weight of the product. You can review the Board’s reasoning by clicking here. Read the full draft of form and method rules by clicking here. We are all watching Attorney General Jeff Sessions, Press Secretary Sean Spicer, and everyone else in the Trump administration to try to figure out how they will approach state-legal marijuana markets throughout the country. Initially, Sean Spicer warned that we might see stepped-up enforcement, although he also indicated that the administration may take different approaches for adult-use and medical marijuana markets. Jeff Sessions has also said that the 2013 Cole Memo was “valid,” and recognized that the Department of Justice may not have the resources to start prosecuting state-legal operators. That being said, he’s kept up his drug warrior rhetoric in public. Here’s some unsolicited advice for Attorney General Sessions and his Task Force: if you want to reduce violent crime, then leave states alone to regulate marijuana to eliminate the black market, increase transparency and safety, and take money away from dangerous cartels. H.R. 1841: Regulate Marijuana Like Alcohol Act. While passage of these bills may be a pipe dream, this could signal an increasing likelihood of reform on the federal level sometime in the next few years. Join me at the Marijuana Business Conference & Expo in Washington D.C.
Last but not least, come out to the Spring Marijuana Business Conference & Expo sponsored by Marijuana Business Daily! The conference will take place from May 16-19 in Washington, D.C., and takes place during the same time as the National Cannabis Industry Association Lobby Days. The Conference will feature over 60 presenters, 275 exhibitors, and attendance is expected to top 3,500 cannabis industry professionals. Believe me when I tell you that this is a terrific conference that you do not want to miss. I will be speaking about Ohio’s market on the Friday of the Conference, so you know there will be some information directly applicable to prospective Ohio medical marijuana cultivators, processors, and dispensary owners. Message me if you would like a discount code to get an additional $50 off of your admission! As always, if you are interested in becoming involved in Ohio’s medical marijuana industry, don’t hesitate to give me a call at (216) 566-8200. This Saturday, February 25, I will be speaking on a panel at the MPP Ohio Canna-Business Seminar in Columbus. My firm, Seeley, Savidge, Ebert & Gourash Co., LPA, is also one of the event’s sponsors. MPP promises “a deep dive into Ohio’s emerging medical cannabis program in Columbus.” The Seminar will feature policy and industry experts, as well as Ohio medical marijuana regulators. Topics covered will include best practices for operating in Ohio’s medical marijuana market, accounting, tax, and liability issues. The Seminar will be hosted at the Sheraton Columbus Hotel at Capitol Square, located at 75 East State Street, Columbus, OH, 43215. Tickets are $600 each, two for $1,000, or three for $1,300. The seminar will run from 10 a.m. to 5:30 p.m. and will include a boxed lunch. But, shoot me an email at tharen@sseg-law.com and I’ll give you a promotional code for a discount on your ticket! Click here to register for the event. See you there! The Department of Commerce recently identified how it will designate territories for Ohio medical marijuana cultivators. By way of background, the current draft of Section 3796:2-1-01(A) provides for up to three Level I cultivators and three Level II cultivators in each of 4 designated territories. This is a change from the original drafts where the Department was to split up Ohio into 12 designated territories. This design runs the real risk of making some quadrants so competitive that well-qualified applicants are shut out based solely on the number of applicants in that territory. In other words, the 5th best Level I applicant in Northeast Ohio may very well be a more qualified applicant than the top applicant in Northwest Ohio, but there will only be 3 Level I licenses awarded in Northeast Ohio. Furthermore, such large territories may encourage consolidation of applicants in closer proximity, as opposed to having cultivators more widely disbursed as would be the case if Ohio had a larger number of territories. 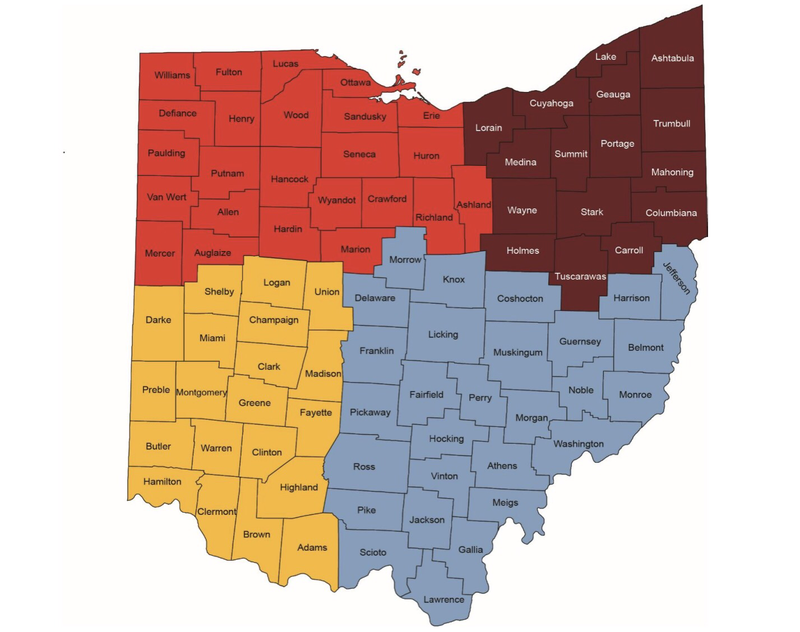 It will be interesting to see if this map changes at all as we continue with the rule-making process, and do not be surprised to see some border counties transition into neighboring territories (for instance, Lorain could very well end up as part of the Northwest quadrant). The Board will remove the requirement of having a “clinical director” either on-site or available by phone during hours of operation (I discussed the clinical director previously). New dispensary rules have not yet been issued, but rest assured I will post an update when they are. Processor application fees will be $10,000 to apply; $90,000 to obtain a certificate of operation; and $100,000 annually to renew a processor license. Check out the latest draft processor rules by clicking here. We know from the draft cultivator rules that Ohio will award “plant-only processor” licenses to cultivators who wish to sell plant material directly to dispensaries, although those entities will have to meet more stringent packaging and labeling requirements than other cultivators. These plant-only processor licenses will cost $5,000 for Level I cultivators and $500 for Level II cultivators. Stay tuned as Ohio continues its rule-making process. And, in the event you are interested in getting involved in Ohio’s medical marijuana industry (whether as a cultivator, processor, or dispensary operator), don’t hesitate to contact us at (216) 566-8200 for a free consultation to discuss your plans. Hi everyone – it’s been a little while since I’ve posted here. Our family moved, work got busier than anticipated (which is a good thing), and all of that occurred right smack in the middle of the holiday season. But fear not, the Ohio Marijuana Law Blog is back in full swing to keep you updated on all of the latest news on medical cannabis in the Buckeye State. The rules for Ohio medical marijuana cultivators will be finalized in May, with the rules for medical marijuana dispensaries, processors, testing laboratories, and recommending physicians finalized in September. The Ohio cultivator rules have been submitted to the Common Sense Initiative, and public comment on the rules are being accepted through this Friday, January 27. Ohio dispensary rules are in their initial draft, although this round of public comments closed on January 13 – there will be other opportunities to provide input. The number of Level II cultivator licenses has increased to 12, and the “marijuana cultivation areas” of both categories has increased: Level I cultivators can have a cultivation area of 25,000 square feet, while Level II cultivators are limited to a cultivation area of 6,000 square feet. If approved by the Department of Commerce, cultivators can expand their facilities not more than twice, each time up to doubling their original size – meaning that Level I cultivators could potentially obtain 75,000 square feet of cultivation area, while Level II cultivators could potentially obtain 9,000 square feet of cultivation area. Ohio would license up to 40 medical marijuana dispensaries, dispersed throughout the state in yet-to-be-defined geographic territories. The Board of Pharmacy would require dispensaries to have a “clinical director” either on-premises or available by phone during all hours that dispensaries are operating. A “clinical director” can be either a pharmacist, physician, physician assistant, certified nurse practitioner, or clinical nurse specialist. I’ll cover each of these drafts in greater detail here in the coming days. It is interesting to note that a draft of House Bill 523 originally required a pharmacist to be present in medical marijuana dispensaries, although that requirement was removed prior to the law going up for a vote. Now it seems the Board of Pharmacy is seeking to re-insert a similar requirement. Alabama Senator Jeff Sessions, whom President Donald Trump has nominated to be his next Attorney General, is waiting on confirmation from the United States Senate. His confirmation hearings generally went off without a hitch, and when asked about legal marijuana, Sessions would not commit to “not enforcing federal law,” although he acknowledged the problem with scarce federal resources. Stay tuned as Ohio moves forward with implementing its medical marijuana program over the coming months.